I want to respond to Corry Shores’ wonderful incorporation of my Spinoza Foci research into his philosophical project (which has a declaimed Deleuzian/Bergsonian direction). It feels good to have one’s own ideas put in the service of another’s productive thoughts. You come to realize something more about what you were thinking. And to wade back through one’s arguments re-ordered is something like coming to your own house in a dream. This being said, Corry’s reading of my material thrills, for he is, at least in evidentary fashion, one of the first persons to actually read it all closely. And the way that he fits it in with his own appreciation for Spinoza’s concepts of Infinity certainly open up new possibility for the Spinoza-as-lens-grinder, Spinoza-as-microscope-maker, Spinoza-as-technician interpretations of his thinking. 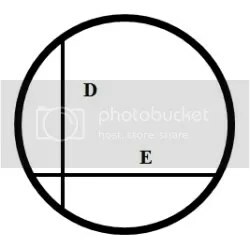 As, for instance, in the case of two circles, non-concentric, whereof one encloses the other, no number can express the inequalities of distance which exist between the two circles, nor all the variations which matter in motion in the intervening space may undergo. This conclusion is not based on the excessive size of the intervening space. However small a portion of it we take, the inequalities of this small portion will surpass all numerical expression. Nor, again, is the conclusion based on the fact, as in other cases, that we do not know the maximum and the minimum of the said space. It springs simply from the fact, that the nature of the space between two non-concentric circles cannot be expressed in number. 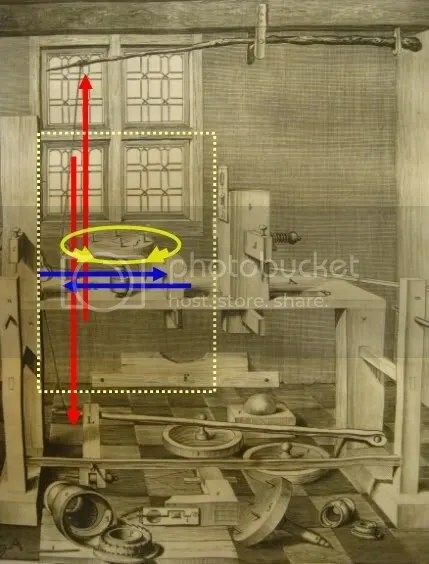 But, and this is where Corry Shores alerted me to something I did not formerly see, the relationship between the two diagrams is even further brought forth when we consider Spinoza’s daily preoccupation with lens-grinding and instrument making. 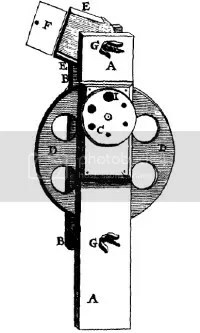 It has been my intuition, in particular, that Spinoza’s work at the grinding lathe which required hours of patient and attentive toil, MUST have had a causal effect upon his conceptualizations; and the internal dynamics of the lathe (which fundamentally involve the frictioned interactions of two spherical forms under pressure – not to mention the knowing human eye and hand), must have been expressed by (or at least served as an experiential confirmation of) his resultant philosophy. If there was this heretofore under-evaluated structuring of his thought, it would see that it would make itself most known in his Natural Philosophy areas of concern, that is to say, where he most particularly engaged Descartes’s mechanics (and most explicitly where he refused aspects of his optics, in letters 39 and 40). And as we understand from Spinoza’s philosophy, Natural Philosophy and metaphysics necessarily coincide. What Shores shows me is that Spinoza’s Bound infinities diagram (letter 12), his very conception of the circle, is intimately and “genetically” linked to the kinds of motions that produce them. 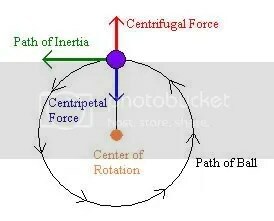 It is with great likelihood that Spinoza is thinking of his off-center circles, not only in terms of the hydrodynamics that circulate around them, but also in terms of Descartes’ tangents of Centrifugal force. There is a tendency in Spinoza to conflate diagrams, and I cannot tell if this is unconscious (and thus a flaw in his reasoning process) or if he in his consummatephilosophy feels that all of these circular diagrams are describing the very same thing simply on different orders of description. But the connection between a tangential tendency to motion conception of the circle (which Corry makes beautifully explicit in terms of optics) and Spinoza’s consideration of bound Infinities in the letter 12 (which remains implicit in Corry’s organization of thoughts), unfolds the very picture of what Spinozahas in mind when he imagines two circles off-center to each other. Spinoza is thinking of is lens-grinding blank, and the spinning grinding form. In any case, when one considers Spinoza’s Bound Infinity diagram, under the auspices of tangential motion tendencies, and the hydrodynamic model of concentric motions, I believe one cannot help but also see that the inner circle BC which is off-center from the first, is representationallythe lens-blank, and the larger circle AD, is potentially the grinding form. And the reason why Spinoza is so interested in the differenitals of speed (and inequalities of distance) between two, is that daily, in his hand he felt the lived, craftsman consequence of these off-center disequilibria. To put it one way sympathetic to Corry’s thinking, one could feel them analogically, with the hand, though one could not know them digitally, with math. The human body’s material (extensional) engagements with those differentials (that ratio, to those ratios), is what produced the near perfectly spherical lens; and the Intellect intuitionally – and not mathematically – understands the relationship, in a clear and distinct fashion, a fashion aided by mathematics and figure illustration, which are products of the imagination. What is compelling about this view is that what at first stands as a cold, abstract figure of simply Euclidean relationships, suddenly takes on a certain flesh when considering Spinoza’s own physical experiences at lens-grinding. Coming to the fore in such a juxtaposition is not only a richer understanding of the associations that helped produce it, but also the very nature of Spinoza’s objection to the sufficiency of mathematical knowledge itself. For him the magnitudes of size, speed and intensity that are buried between any two limits are not just abstract divisions of line and figure, or number to number. They are felt differentials of real material force and powers of interaction, in which, of which, the body itself necessarily participates. The infinities within (and determinatively outside of) any bound limits, are mechanical, analogical, felt and rational. Corry raises some very interesting relationship question between the Spinoza Bound Infinities Diagram and the Diagram of the Ideal Eye from letter 39. They are things I might have to think on. The image of the ideal eye is most interesting because it represents (as it did for Descartes) a difficult body/world shore that duplicates itself in the experiential/mathematical dichotomy. Much as our reading of the duplicity of the Bound Infinity Diagram which shows mathematical knowledge to be a product of the imaginary, the diagram of the ideal eye, also exposes a vital nexus point between maths, world and experience. It should be worthy to note that Spinoza’s take on the impossibility of maths to distinguish any of the bound infinities (aside from imposing the bounds themselves), bears some homology to Spinoza’s pragmatic dismissal of the problem of spherical aberration which drove Descartes to champion the hyperbolic lens. When one considers Spinoza’s ideal eye and sees the focusing of pencils of light upon the back at the retina (focusingswhich as drawn do not include the spherical aberration which Spinoza was well-aware of), one understands Spinoza’s appreciation of the approximate nature of perceptual and even mathematical knowledge. This is to say, as these rays gather in soft focus near the back of the eye (an effect over-stated, as Spinoza found it to be via Hudde’s Specilla circularia), we encounter once again that infinite grade of differential relations, something to be traced mathematically, but resultantlyexperienced under the pragmatic effects of the body itself. 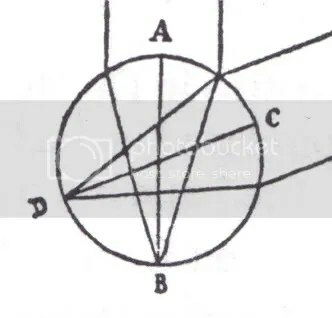 “The eye is not so perfectly constructed” Spinoza says, knowing as well that even if it were a perfect sphere there as yet would be gradations of focus from the continumof rays of light so refracted by the circular lens. What Spinoza has in mind, one strongly suspects, and that I have argued at length, is that the Intellect, with its comprehensive rational in-struction from the whole, ultimately Substance/God, in intuitional and almost anagogic fashion, is the very best instrument for grasping and acting through the nature of Nature, something that neither bodily perception, or mathematical analysis may grasp. Indeed, as Corry Shores suggests in his piece, it is the very continuum of expressional variability of Substance (real infinities within infinities) which defies the sufficiency of mathematical description, but it is the holistic, rational cohesion of expression which defies experiential clusterings of the imagination: the two, mathematics and imaginary perception, forming a related pair. In the end I suspect that there is much more to mine from the interelationship between Spinoza’s various circular diagrams, in particular these three: that of the relationship of the modes to Substance (EIIps), that of the the hydrodynamics of circulating water (PCP, implicit in the Letter 12 diagram of Bound Infinites), and the Ideal eye (letter 39), each of these to be seen in the light of the fundamental dynamics of the lens-grinding lathe to which Spinoza applied himself for so many years, and at which he achieved European renown expertise. On this account by my wondrous instrument’s clear power I detected something seen that is even more wondrous: the intestines plainly, the liver, and other organs of the viscera to swarm with infinitely minute animalcules, which whether by their perpetual motion they corrupt or preserve one would be in doubt, for something is considered to flourish and shine as a home while it is lived in, just the same, a habitation is exhausted by continuous cultivation. Marvelous is nature in her arts, and more marvelous still is Nature’s Lord, how as he brought forth bodies, thus to the infinite itself one after another by magnitude they having withdrawn so that no intellect is able to follow whether it is, which it is, or where is the end of their magnitude; thus if in diminishments you would descend, never will you discover where you would be able to stand. Let us imagine, with your permission, a little worm, living in the blood¹, able to distinguish by sight the particles of blood, lymph, &c., and to reflect on the manner in which each particle, on meeting with another particle, either is repulsed, or communicates a portion of its own motion. This little worm would live in the blood, in the same way as we live in a part of the universe, and would consider each particle of blood, not as a part, but as a whole. He would be unable to determine, how all the parts are modified by the general nature of blood, and are compelled by it to adapt themselves, so as to stand in a fixed relation to one another. There is great conceptual proximity in these two descriptions, suggesting I imagine that Spinoza used his microscopes as well, for observation, not to mention that Kerckring and Spinoza come from a kind of school of thought on scientific observation of human anatomy, perhaps inspired by or orchestrated by Van den Enden, as argued by Klever. Just the same, at the very least, Kerckring presents greater context of just what kinds of retreating infinities Spinoza had in mind in his letter 12 diagram, not simply a differential of motions, but also a differential of microscopic magnitudes, each of which were an expression of an ultimate destruction/preservation analysis, something that falls to the very nature of what is body is. Spinoza not only ground lenses, but also made both telescopes and microscopes, gazing through each at the world, this at a time when the microcosmic and macrocosmic, nested infinities were just presenting themselves to human beings. And as such his critique of scientific observation and mathematical calculation preserves a valuable potentiality for our (postish) modern distancings and embrace of the sciences. 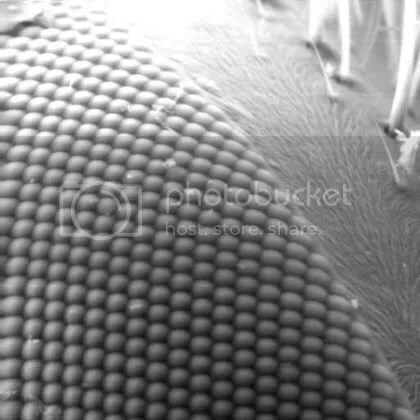 When tracking down the possible techniques in microscope construction Spinoza may have pursued, it seems that such tiny spherical lenses may have a possible design that Spinoza used. In support of this a Spinoza correspondent and, it seems, collaborator, Johannes Hudde had practiced the single lens, bead technique as early as 1663, and was an advocate to the technique to Moncoyns and then Huygens. It would seem certainly that Spinoza had heard of it, and because of its ease, one may surmise that he at least tried it out. And given Spinoza’s championing of smaller objective lenses for microscopes in his informal debates with Huygens, one would think that he had some experimental success. As far as I can tell little is known of how this technique came to Western Europe, one supposed from Italy. 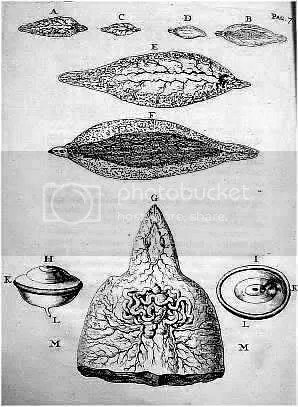 Robert Hooke had it by 1664 and Hudde and Vossius had something like it in 1663. 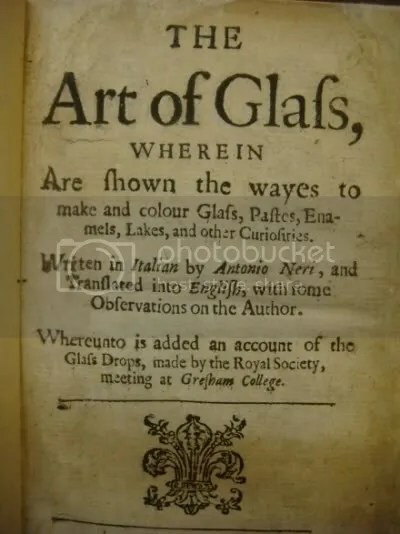 A piece in this development may though have been published in 1662, in an English translation of selections of Antonio Neri’s L’Arte Vetraria, The Art of Glass. (Interestingly Spinoza died with a 1668 edition of Neri’s book.) 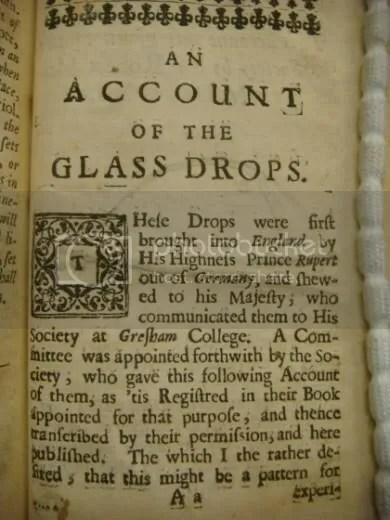 Published in the 1662 English edition is an account of the Royal Society experiments with &quot;Glass Drops&quot;, a technique brought to Charles II after the Restoration by the excentric and sometimes brilliant German prince Rupert who became a member of Charles’s privy council. 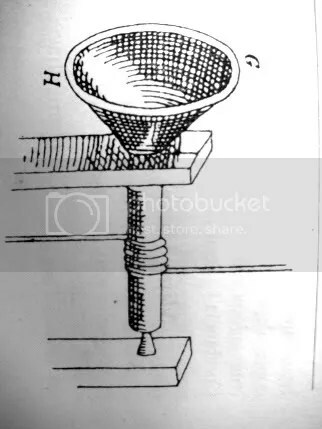 As one can see from the below, the method of forming drops straight from the pot to be cooled in various liquids was NOT the one used by Robert Hooke a couple of years later, but one can perhaps consider that the production of these very fine threads at the end of small dollops of glass may be related to the development of the single lens thread-melting technique (perhaps in conjunction with other sources). 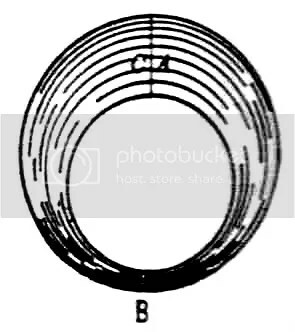 I post below a transcription of the original text as a resource for the study of the development of the bead lens technique. I have not read further accounts of this testing, nor have I invested the time to look at other Royal Society experiments during this time. An Account of the Glass Drops. 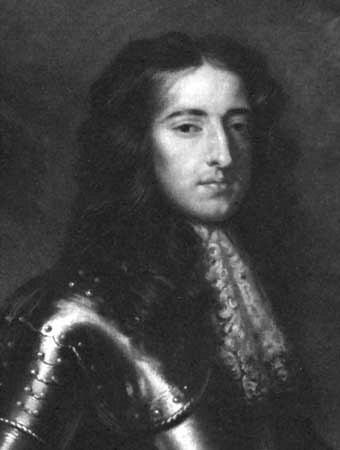 Here Drops were first brought into England by his Highness Prince Rupert out of Germany and shewed to his Majesty, who communicated them to His Society at Gresham College. 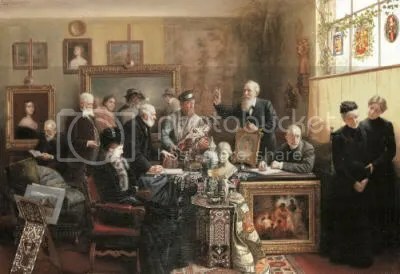 A Committee was appointed by the Society, who gave this following Account of them, as ’tis Registred in the Book appointed for that purpose, and thence transcribed by their permission, and there published. The which I the rather desired, that this might be a pattern for experiments to be made in any kinde whatsoever, as being done with exceeding exactness. This account was given to the Society by Sir Robert Morray. MDCLXI. A B the thread, B C the body, B the neck, A the point or end of the thread. They are made of Green-glass well-refined; til the Metall (as they call it) be well refined, they do not at all succeed, but crack and break, soon after they are drop’t into the water. The best way of making them, is to take up some of the Metall out of the pot upon the end of an Iron rod, and immediately let it drop into cool water, and there lye till it cool. If the Metall be too hot when it drops into the water, the Glass drop certainly frosts and cracks all over, and falls to pieces in the water. Every one that Cracks not in the water, and lies in it, till it be quite cold, is sure to be good. The most expert Workmen, know not the just temper of the heat, that is the requisite, and therefore cannot promise before hand to make one that shall prove good, and many of them miscarry in the making, sometimes two or three or more for one that hits. Some of them frost, but the body falls not into pieces; others break into pieces before the red heat be quite over, and with a small noise; other soon after the red heat is over, and with a great noise; some neither break nor crack, till they seem to be quite cold; other keep whole whilest they are in the water, and fly to pieces of themselves with a smart noise as soon as they are taken out of the water; some an hour after, others keep whole some days or weeks, and then break without being touched. If one of them be snatched out of the water whilst it is red hot, the small part of the neck, and so much of the thred or string it hangs by, as has been in the water, will upon breaking fall into small parts, but not the Body, although it have as large cavities in it, as those that fly in pieces. If one of them be cooled in the air, hanging at a thread, or on the ground, it becomes like other Glass, in all respects, as solidity, &c.
When a Glass drop falls into the water, it makes a little hissing noise, the body of it continues red a pretty while, and and [sic] there proceed from it many eruptions like sparkles, that crack, and make it leap up and move, and many bubbles do arise from it in the water, every where about it, till it cool: but if the water be ten or twelve Inches deep, these bubles diminish so in the ascending, that they vanish before they attain the superficies of the water; where nothing is to be observed, but a little thin steam. The outside of the Glass drop is close and smooth like other Glass, but within it is spungious, and full of Cavities or Blebs. The figure of it is roundish at the bottom for the most part, not unlike a pear pearl, it terminates in a long neck, so that never any of them are straight, and most of them are Crooked and bowed into small folds and wreaths from the beginning of the neck till it end in a small point. Almost all those that are made in water have a little protuberance or knob a little above the largest part of the body, and most commonly placed on the side towards which the neck ends, although sometimes it be upon that side that lies uppermost in the vessel where it is made. If a Glass drop be let to fall into water scalding hot, it will be sure to crack and break in the water either before the red heat be over, or soon after. In Sallet Oyl they do not miscarry so frequently as in cold water. In oyl they produce a greater number of bubbles, and larger ones, and they bubble in oyl longer than in water. Thsoe that are made in oyl have not so many, nor so large blebs in them, as those made in water, and divers of them are smooth all over, adn want those little knobs that the others have. Some part of the neck of those that are made in oyl, & that part of the small thread that is quenched in it cool’d, breaks like common Glass. But if the neck be broken neer the body, and the body held close in ones hand, it will crack and break all over: but flies not into so small parts, not with so smart a force and noise as those made in water, and the pieces will hold together till they be parted: and then there appears long freaks or rays upon them, pointing towards the center or middle of the body, and thwarting the little blebs or cavities of it, whereof the number is not so great, nor the size to large as in those made in water; if the Glass drops be dropt into vineger, they frost and crack, so as they are sure to fall to pieces before they be cold, the noise of falling in is more hissing than in water, but the bubbles not so remarkable. In milk they make no noise, nor any bubbles that can be perceived, adn never miss to frost and crack, adn fall in pieces before they be cold. In spirit of wine they bubble more than in any of the other liquors, and while they remain entire, tumble too and fro, and are more agitated than in other liquors, and never fail to crack adn fall in pieces. By that time five or six are dropt into the spirit of wine, it will be set on flame: but receive, no particular taste from them. In water wherein Nitre or Sal Armoniack hath been dissolved, they succeed no better than in vineger. In oyl of Turpentine one of them broke as in the spirit of wine, but the second set it on fire, so as it could no more be used. In Quick-silver, being forced to sink with a stick, it grew flat and rouch on the upper side: but the experiment could not be perfected, because it could not be kept under till it cool’d. In an experiment made in a Cylindrical Glass, like a beaker filled with cold water of seven or eight onely one suceeded, the rest all cracking and breaking into pieces, onely some of the company, who taking the Glass in their hand, assoon as the drop was let fall into it, observed that at the first falling in, and for some time after, whilst the red heat lasted, red sparks were shot forth from the drops into the water, and that at the instant of the eruption of those particles, and of the bubbles which manifestly break out of it into the water, it not only cracks and sometimes with considerable noise, but the body moves and leaps, as well of those that remain whole in the water, as those that break. A blow with a small happer, or other hard tool will not break one of the Glass Drops made in water, if it be touched no where but on the body. 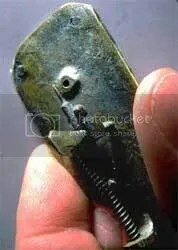 Break of the tip of it, and it will fly immediately into very minuted parts with a smart force adn noise, and these parts will easily crumble into a coarse dust. If it be broken, so that the sparks of it may have liberty to fly every way, they will disperse themselves in an orb with violence like a little Granado. Some being rubed upon a dry tyle, fly into pieces by that time the bottom is a little flatted others not till half the rub’d off. One being rub’d till about half was ground away, and then layed aside, did a little while after fly in pieces without being touched. Another rub’d almost to the very neck on a stone with water and Emery did not fly at all. If one of them be broken in ones hand under water, it strikes the hand more smartly, and with a more brisk noise than in the air: yeah, though it be held near the superficies none of the small parts will fly out of it but all fall down without dispersing as they do in the Air. One of them borken in Master Boyles Engine, when the Receiver is well Evacuated will fly in pieces as in the open air. Anneal one of them in the fire, and it will become like ordinary Glass, onely the spring of it is so weakned, that it will not bend so much without breaking as before. A Glass drop being fastned into a cement all but a part of the neck and then the tip of it broken off it made a pretty smart noise but not so great as those use to do that are broken in the hand, and though it clearly appears ot be all shiver’d within, and the colours turned grayish, the outside remained smooth, though cracked, and being taken in pieces, the parts of it rise in flakes, some Conical in shape, and so crack all over that it easily crumbled to dust. One fastned in a ball of cement some half an Inch in thickness, upon the breaking off the tip of it, it broke the ball in pieces like a Granado. Two or three of them sent to a Lapidary to peirce them thorow, as they do Pearls, no sooner had the tool entred into them, but they flew in pieces as the use to do when the tip of them is broken off. For those that have been following my thought process and research, for a brief moment I believed we may have found another user of a Spinoza microscope, Govert Bidloo in a 1698 open letter to van Leeuwenhoek on the nature of the flatworm parasite F. hepatica. Unfortunately in looking at the text of the letter yesterday I found it only to be a thorough-going reference to Theodor Kerckring’s own use of a Spinoza microscope in his 1670 Specilegium anatomicum, thus far the only first hand account of observations made with an instrument fashioned by Spinoza’s hand. But the citation is not without merit. As I pointed out in a previous post, in addition to being professor of Medicine and Anatomy at Leiden University, Bidloo was apparently a republican pamphleteer at the time of great social unrest, and the year before his friend Eric Walten had died in prison as a result of the vehiment side taken in the the Berkker controversy, under the force of the vague charge of being a dangerous Spinozist. In this context, the reference to Spinoza’s microscope in a scentific discourse looking to elucidate the source of diseases of the body seems to be something more than coincidence. Spinoza’s lens, and Kerckring’s observations through it, is positioned by Bidloo between two perceived kinds of diagnostic failure. Worms in the legs, the scrotum, and a tumor and bladder full of fulls are mentioned by the Misc. Cur., Years 3 and 4, Obs. 173, and the Year 7, Obs. 16. In scabies and varioles they are described by Borellus [l.c. ], Obs. 72. In pustules, varioles, and the whole of the body: Rhodius [l.c. ], Obsc. 64, Part 3. A wholly wormy man (alas! that only this disease were somewhat rare!) is reported by the Danes in their [Acta Hafn. [ Part 3, Obs. 11. 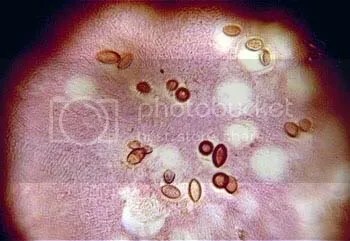 Severe symptoms caused by mites are reported by Hildanus [l.c. ], Obs. 96, as well as by Benetus [l.c.] in his last Obs., Part 35: “a constant production of worms from infancy to great age. Observations about aged worms of different forms, big and small worms, and other animalcles in all parts of the body are to be found. The dispute, or rather the argument will now have to concern the question of whether these animalcules, which are admitted to be found in the parts of living human bodies, can or cannot be causes of diseases and their symptoms, the more so because, amongst others, TH. KERCKRING, a man who has gained a great reputation in anatomy and medicine, doubts it, when on p. 177 in his [Specilegium anatomicum] Obs. 93 he tries to demonstrate the uncertainty of the opinion that is formed about things in anatomy by means and with the aid of magnifying glasses. He deduces this uncertainty: 1. from the smallness of the sharp centers of the field of view; 2. from the change of color; 3. from the alternate inspection of several parts so that what now seems to be separate in reality is united, nay, united physically. But after having highly commended a certain magnifying glass and its maker, B. Spinoza, he adds these words: by means of this my admirable instrument I saw very wonderful things, viz. that the intestines, the liver, and all the tissue of the other intestines are filled with an infinite number of tiny animalcules; however, a person who considers that a house which is inhabited is clean and bright, but nevertheless wears away through the constant maintenance of those who inhabit it, will tend to doubt whether these animalcules spoil or maintain these parts through their continuous movement. Put aside by Bidloo is Kerckring’s equanimity of observation though, the inability to tell if the swarms of animals are the sign that the body’s home is florishing in the glow of vivacity, or is being spoiled and overrun by inhabitation. Kerckring’s wider view of the possible symbioses of an organism, in keeping perhaps with Spinoza’s whollistic conception of the interdependency of an expressive mechanism, for Bidloo falls to the sure evidence of minute and proliferate causes of bio-destruction: parasites corroding the canals of the body. This makes an interestingly thought-picture for the personal physician to William III, King of England and Dutch Republic Stadtholder, a man in favor republican values in criticism of the Reformed Chuch. One may suppose that Reason and close observation will guide us into discovering the plethora of worms and animalcules in society, those infesting and injuring the transportation systems and organs of healthy conduct. 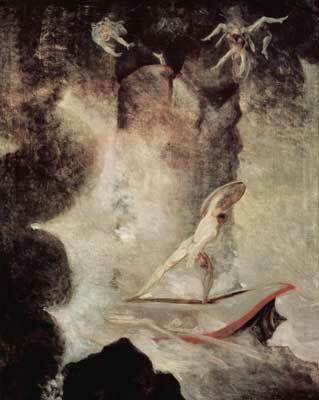 In citing Spinoza’s lens, and Kerckring’s vision of the teeming animalcules and worms, Bidloo evokes a complex of reason and invasion, a political eco-vision in which the proverbial Scylla (the chicanery of vaguely-diagnosing, self-serving “experts”) is torqued against the threatening Charybdis (a chaos of rabble and infestation), given over to the steerage of social health. Importantly, Spinoza’s lens is juxtaposed, (symptomatically), as a kind of clear crystal manifestion of the narrows through which the two can be negotiated. Govert Bidloo, A Spinoza Microscopist? Physician to the King and Another Spinoza Microscope? I stumbled upon some evidence that there is a second Spinoza microscope in the historical record, and it is my hope that this glass may bring to view more of the details for which I have been straining. 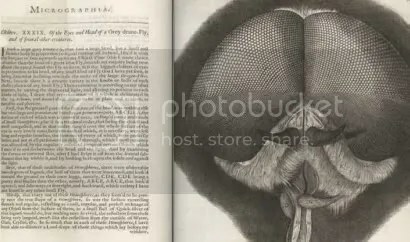 Thus far, the only first hand report we have is from Spinoza’s fellow Latin student, and possible van den Enden disciple, Theodore Kerckring, who in his Spicilegium anatomicum (1670), describes how with Spinoza’s glass he had seen a “infinitely minute animalcules” teeming upon the viscera. This description is to be questioned, firstly, because Kerckring himself warns us a few sentences before, that all observations of microscopes have to be doubted; but also because Kerckring reported elsewhere some microscopic observations which plainly come from the imposition of fantasy upon sight. In this case the account may be more sobering and exact, though I have yet been able to actually assess the content of the claim. The report comes apparently from Govert Bidloo, and man of fairly high standing, and apparently connections to Spinozist political movements of his day. In 1694 Bidloo was appointed professor of anatomy and medicine at the university of Leiden, a post to which he was not able to well-attend due to also becoming the personal physician to stadholder William III, who would die in his arms in 1702. If indeed Govert Bidloo did use and favor a Spinoza microscope, he was a well-connected anatomist and physician, and public champion of microscopic investigation. The fact of Bidloo’s use of a Spinoza microscope is at this point circumspect, as for the moment I have only a summary of the mention of praise for a Spinoza microscope-glass (vergrootglass), in a memoir-letter written to the famed microscopist Antony van Leeuwenhoek, subsequently published in the same year, 1698. I do not read Dutch, so I had to rely upon the summation of a website owner to understand its content. This is found here. The citation given, aside from the letter itself, is not traceable. Perhaps it is a television production:  “Cells of Spinoza”: Tetsuro Onuma, Representative of Yone Production Co.Ltd. (2002). The phase “quoting the quality of the Magnifying glass” I assume probably means “citing the quality”. Because the context is missing for me, there is no way to affirm what I would suspect, that Bidloo is writing to van Leeuwenhoek about his observations of small parasites and their eggs, as found in the liver of sheep, and it is by virtue of the excellence of Spinoza’s glass that his observations are assured. This is somewhat also how Kerckring references his Spinoza microscope. …in the bile of suckling lambs there are very little globules, and some, though very few, bright particles. which are a bit bigger; besides irregular particles, of divers figures, and also composed of globules clumped together. The bile of yearling sheep I find to be like that of suckling lambs, only with this difference, that in this bile there are also oval corpuscles of the bigness and figure of those I remarked in ox-bile. (Letter 7 to the Royal Society, October 19th 1674). Indeed, the lifecycle of F. hepatica is quite complex, as it relies upon a symbiont aquatic snail, something no microscope would reveal to these men, but it is good to note that Bidloo’s microscope and analysis did properly identify the eggs of F. hepatica, something which may give clue to the magnification of his glass. 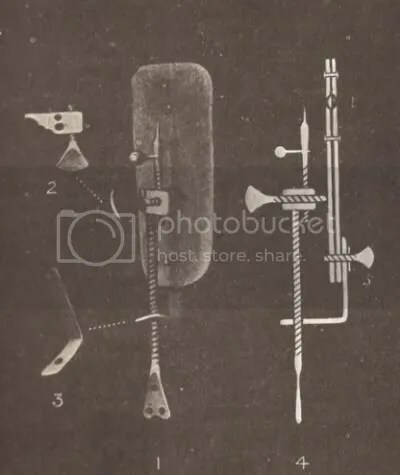 It would appear that the two men were operating under at least remotely similar powers of glass, and at this point van Leeuwenhoek had achieved magnification really beyond compare for the century. According to their optical appearance and approximate measurements, we isolated about 1,300-1,500 ‘large’ eggs from a fairly large quantity of sheep faeces. Of these, 300 were measured and their average size was found to be 154 (143-180) x84 (75-102) µm. 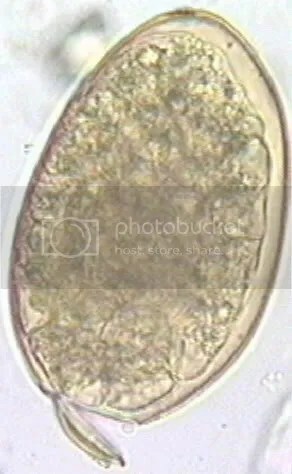 Fasciola eggs of normal size found in the faeces of the same sheep measured 129 (107-162)x 71 (61-79) µm. 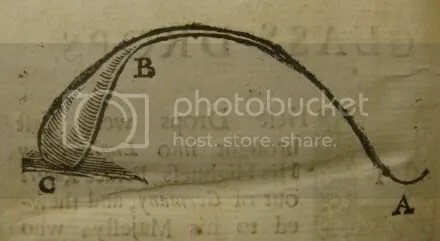 As I have not read Bidloo’s account, I as yet cannot tell if his glass resolved such detail, but van Leeuwenhoek’s description of “oval corpuscles” must have. And we should keep our mind open to this possibilities. 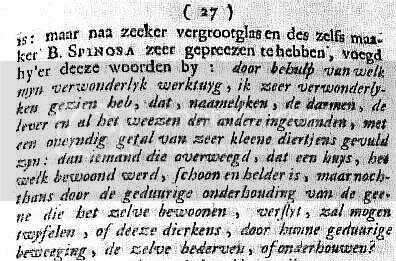 If we are to speculate, having identified what Bidloo saw and concluded, and assumed that he used a Spinoza made glass, what was the nature of Spinoza’s “vergrootglas”? Literally, this word means “magnifying glass”, something distinct from the word for microscope. It is the same word used to describe the instruments sold from Spinoza’s estate at auction on November 4th, 1677. (It is even conceivable that this was one of those instruments.) A vergrootglas could be anything from a swivel-armed spectacle glass used for dissection and study, to the very powerful simple, single-lens microscopes that Swammerdam and van Leeuwenhoek used. Aside from the more famous Leiden anatomists who used a simple microscope, we are told that Bidloo’s successor to the university position, Boerhaave, used a lens as small as a grain of sand (Ruestow 95). But the story is unclear. Bidloo was a student and friend to Ruysch, a fellow student and associate of Kerckring from ’61 onwards, who used magnification quite sparingly, and would have had no need of such an intense and difficult lens. Whether Govert Bidloo used Spinoza’s microscope in his observations on the hepatica or not, I cannot say for certain now, but his reference in the published memoir, in the context of his observations on parasites of the body and a suspicion that they lead to human illness no doubt reflected to some degree the events that of the years previous, and the sourness of the death of Walten in prison. What comes to mind is Spinoza’s reflection to Oldenburg so many years before, that we are like a worm in the blood, how our perceptions are only most often local to what jostles us, itself a reflection on Kircher’s microscopic discovery of worms in the blood of plague victims. (Some thoughts here: A Worm in Cheese ). One must remember that this was not only a time of political and religious upheaval, but also a time of plague. The clearness of Spinoza’s glass no doubt, in the minds of his admirers, expressed the clarity with which the political body must be examined. Bidloo’s study of the bile of sheep, in search of parasites with Spinoza’s glass either in hand or in mind, surely struck him as fitting. Having now read Marian Fournier’s “Huygens’ Designs for a Simple Microscope” (1989) the extended hypothesis that Christiaan Huygens was somehow aided in his quick production of a “new microscope” by the grinding techniques that may have been found in the purchase of equipment from Spinoza’s estate, suffers complication. This is largely due to the remission of any detail as to the grinding of lenses in this rather through report. Indeed, there is text citation as to the blowing of lenses [cited is a manual OC viii, Part II, 683-4 and OC viii, 89 letter dated 30 July 1678 ]. Having not read these passages I cannot say for sure how exclusive these descriptions are, since they are taken to be refinements of the blowing techniques themselves. It is possible, at least from this distance, that such blown lenses were then ground, but as there is no existent discussion of such a process, it is hard to embrace that this formed a decisive aspect of the process. 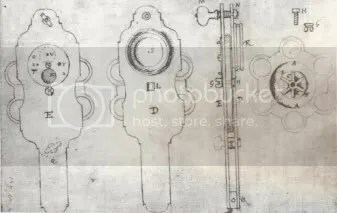 Instead it seems that Christiaan and Constantijn were absorbed with nearly every other aspect of the microscope model, trying multiple configurations of the frame, the eyepiece, diaphragm, specimen holding means, etc. 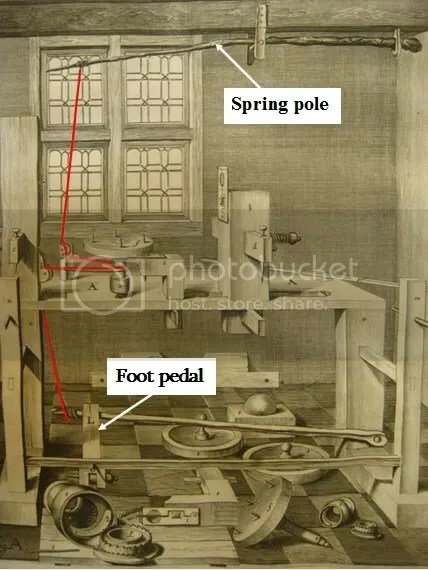 This relative silence as to the lens could I suppose suggest that by June 1668 the technique of lens grinding (if assumed) was settled on, and all that remained for improvement was the apparatus. 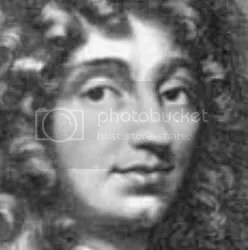 Christiaan Huygens is in The Hague, returned from Paris due to illness, from June 1676 to July 1678. Feb 21 1677 – Spinoza dies in The Hague. 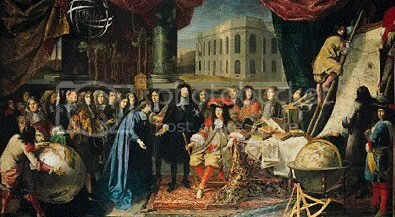 Unknown date – Christiaan translates Van Leeuwenhoek’s letter to the Royal Society dated Feb 15 1677 into French. 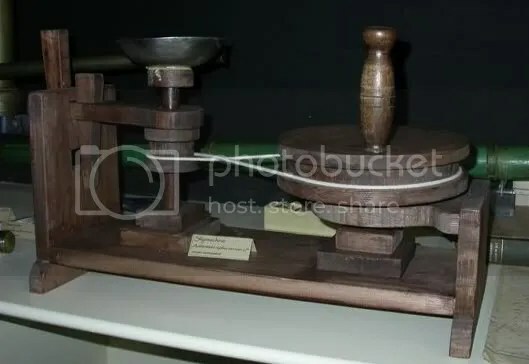 Nov. 4 1677 – The Huygenses possibly purchase the grinding dishes and other equipment from the Spinoza Estate. March 1678 – already in close contact, Hartsoeker sends Christiaantwo microscopes and instructions for their use. Two attributes are noted: 1). a 1 to 1½ ft tube used to restrict ambient light on the specimen, and 2). a movable glass, polished or plain, behind the object to control the beam of light (dating letters 14 and 25 March, 4 April . [Ruestow adds that Hartsoeker did not only mail these, but also at the end of March came to The Hague to show the spermatozoa of a dog in person]. 26 March 1678 – Christiaan orders a single lens microscope from the renowned Van Musschenbroek workshop. May 1678 – Christiaan completes the first drawn version of the design his microscope. An Article on the authorship of the microscope is published in the Journal des Sçavans, crediting Harksoeker with primary credit for the control of specimen lighting, and Huygens for that of the sandwiching of the speciment between glass and mica discs. Fournier, quite differently than Ruestow, paints Huygens in Paris as being very reluctant for the recognition of his microscope. Ruestow is quite convinced that Huygens attempted to cheat Hartsoeker of some credit. 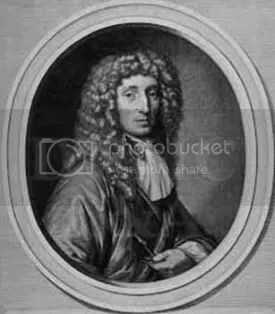 Given that Huygens was returning to Paris after a two year absence, and that the credit he probably wished was from the society members he made his presentations to, and intercoursed with daily. It seems unlikely that issues of priorty and publication are those that defined Huygens sense of identity and self-esteem. And Fournier brings out more than any other source the ubiquity of this kind of lens scope, confirming my suspicion it was not at all the lens beading technique which Hartsoeker supplied to Huygens. In fact it seems that Huygens “recently” had visited the house of the master of the small lens, Van Leeuwenhoek (581). Given that over time Huygens’s design would move away from the distinct component that Harksoeker is credited with contributing, as Fournier reports, “the development proceeded from a very long tube to a simple perferation directly behind the object, which served to limit the amount of stray light” (589), one wonders just where Hartsoeker’s fingerprint on the device remains. He particularly deplored their very limited lack of depthof field. He foundit inconvenient that with such a small lens one could not see the upper andunderside of an object, a hair for instance, at the same time (“Huygens’ Design…” 579). …he fixes whatever object he has to look uppon, then holding it up to the light…but in one particular [after viewing many disappointingly low magnification glasses] I must needs say that they far surpass them all [several Glasses I have seen in both England and Ireland], that is in their extreme clearness, and their representing all objects so extraordinary distinctly. for I remember that we were in a dark rome with only one Window, and the sun too was then of a that [off to the window], yet the objects appeered more fair and clear, then any I have seen through Microscopes, though the sun shone full upon them, or tho they received more then ordnary LIght by help of reflectiv Specula or otherwise: so that I imagine tis chiefly, if not alone in particular, that his Glasses exceeds all others, which generally the more they magnify the more obscure they represent the Object; and his only secret I believe is making clearer Glasses, and giving them a better polish than others can do (Dobell 58). 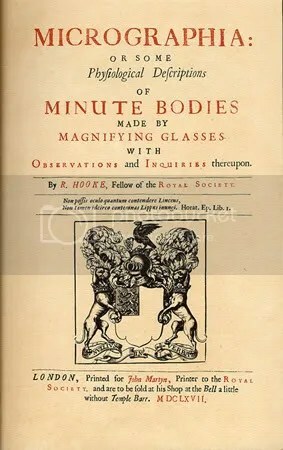 Though this account is for a lens much latter in design than the 1677/78 microscopes under immediate consideration, Molyneux’ description seems to place great weight, even at that date, upon the importance of polish (and glass quality), allowing us to focus on the possibility that the Huygenses affection for Spinoza’s polishing techniques may have had an influence on their purchase of his remaining Estate, and a consequence upon the design of their July 1678 microscope.